There is a nice responsive tabs plugin which is jQuery based called aptly called Responsive-Tabs, it handles changing the layout from a tabbed contant structure to an accordion layout at a set media query size. The accordion layout is better suited for smaller mobile/tablet sizes. Download the plugin and extract jquery.responsiveTabs.min.js and file in your js theme folder also get the CSS files and file in your css folder, the plugin comes with 2 of them, I have put them together and slightly adjusted them to remove demo styling and give a more neutral initial style. Also adding some dashicon icons for the open/close symbols. My CSS file is below. 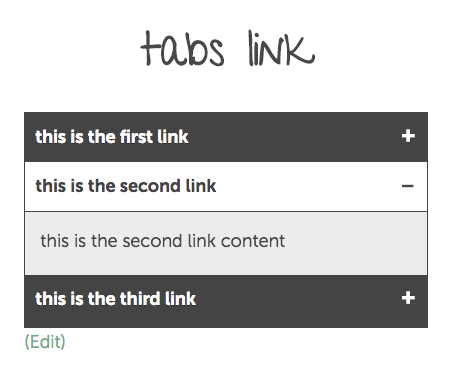 The init file is using the id #tabs1 which is the id used in the html structure, use what you like and for more parameters check out the options here. That’s it – I have written something similar using Tabslet and ACF, you can incorporate the ACF repeater code straight in, as the HTML mark up is the same. If you are after a straight up WordPress plugin and shortcode there is the very popular Tabby Responsive Tabs. Since I have also posted this using ACF on ACF Extras website.